Not so long ago Subaru had things pretty much their own way. If you wanted (or should that be needed) a 4 four-wheel drive family estate car, you bought a Subaru or… well, your choices were somewhat slim. Then Volvo made the V70 Cross-Country, Audi quickly followed with the A4 Allroad, and the middle-classes all decamped to the countryside come the weekend. Next came the likes of the Nissan Qashqai; the SUV and cross-over floodgates well and truly opened. No school-run mum worth her salt ventures out these days without the aid of a commanding driving position, extra ground clearance, and a faux-aluminium sump-guard. Four-wheel drive on the hand – strangely, that’s become optional. Nevertheless, Subaru have stuck to their guns. Their latest entry into the every expanding market of go-anywhere (within reason) family transport is this: their new XV. It’s powered by a turbocharged 4-cylinder boxer engine. And, true to form it’s got symmetrical four-wheel drive. It’s also quite stylish. Crossovers and SUVs tend to be quite square whereas the XV is altogether wedgier. Compared to the old XV this new one has a more sharply raked windscreen, and the roofline has been lowered at the rear. There’s also a sleeker grille this time around, some chrome accents and of course the de-rigueur cladding around the wheel arches and the lower sections of the front and rear bumpers. Is the new XV good-looking? Let’s settle on ruggedly handsome shall we? What you can’t see is the XV’s new chassis. It’s actually the second Subaru to be built on the Japanese manufacturer’s new and significantly stronger Global Platform, which, they say is much stiffer than that of the outgoing XV, and offers a 70% increase in torsional rigidity. 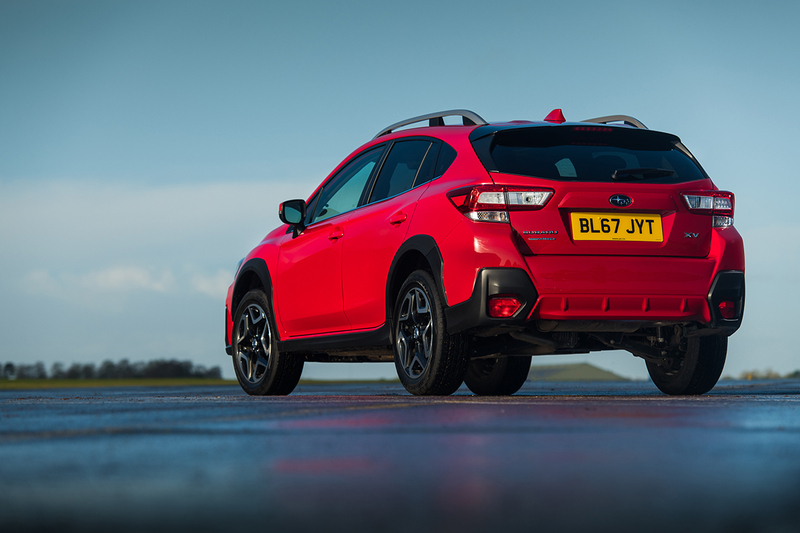 Said all-new underpinnings have been designed to accept either Subaru’s 1.6 litre flat four petrol engine, or the more powerful (114 bhp plays 156) 2.0 litre flat four petrol as per “our” car. 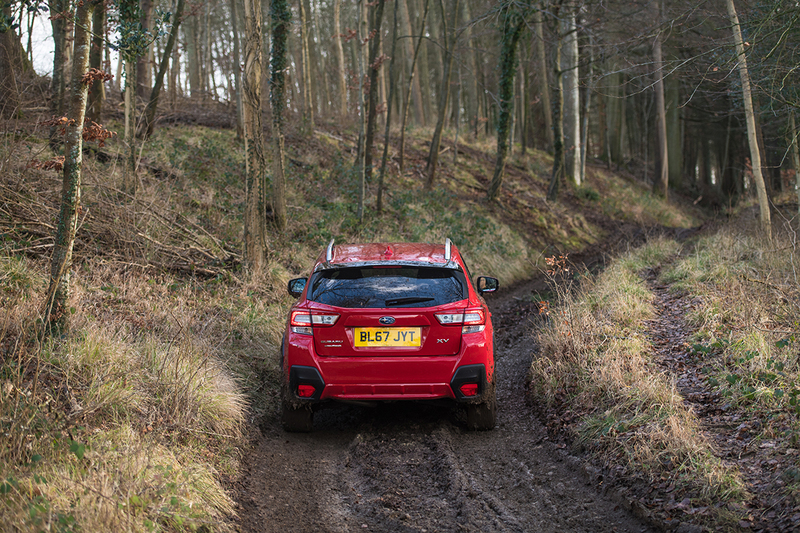 Subaru aren’t offering a diesel XV this time around. And neither are they offering the trademark boxer’s off-beat wob-wob-wob exhaust note that once made Subarus sound so good (and recognisable from at least 200 yards away). It’s been pensioned-off, apparently, in the name of refinement. Hmm…Refinement, in a Subaru? Well, yes and no. All things are relative after all and while it’s probably fair to say that Subaru’s interior fittings err far more towards durability than they do desirability that’s not to say you’re left wanting equipment-wise. DAB, an 8inch touchscreen sat-nav with Bluetooth and Apple CarPlay/Android Auto, dual-zone climate control, automatic LED headlights with auto-dipping, heated leather seats, roof-rails, a reversing camera, hill-descent control … the list goes on. All are standard fit on the XV 2.0 Premium Subaru lent us. So too is EyeSight, Subaru’s innovative and highly acclaimed driver assist technology which uses two stereo cameras to capture three-dimensional colour images, and is said to be nearly as capable as the human eye. A camera is mounted either side of the rear-view mirror in order to monitor the road ahead, for up to 110 metres, for potential hazards. The images taken are compared; the larger the displacement, the closer the object. EyeSight also works with the adaptive cruise control and the XV’s rear collision detection system and will apply the brakes fully, and automatically in the case of any emergency. Hopefully you’ll never need it, nevertheless it’s reassuring to know it’s there. And as for driving the XV yourself? 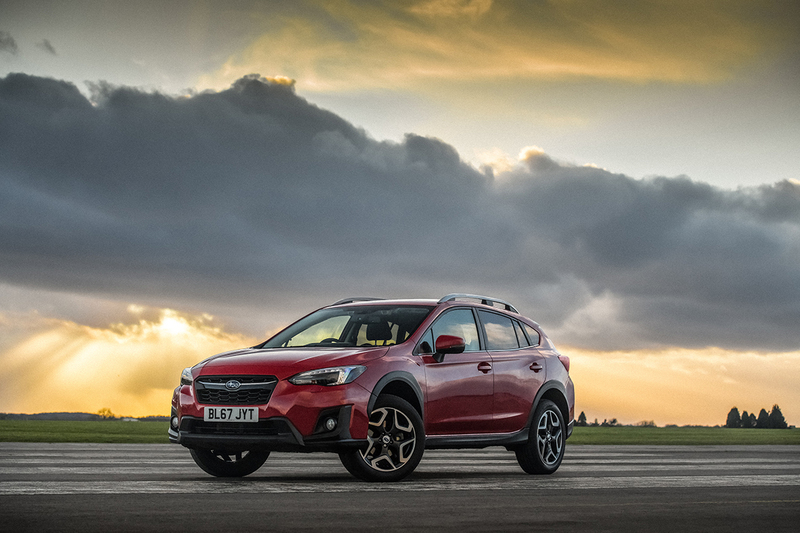 Subaru have gone to great lengths to improve how the new XV feels compared to the old one. They’ve made the steering sharper, the ride better, and they’ve significant-ly reduced the tell-tale SUV body-roll. 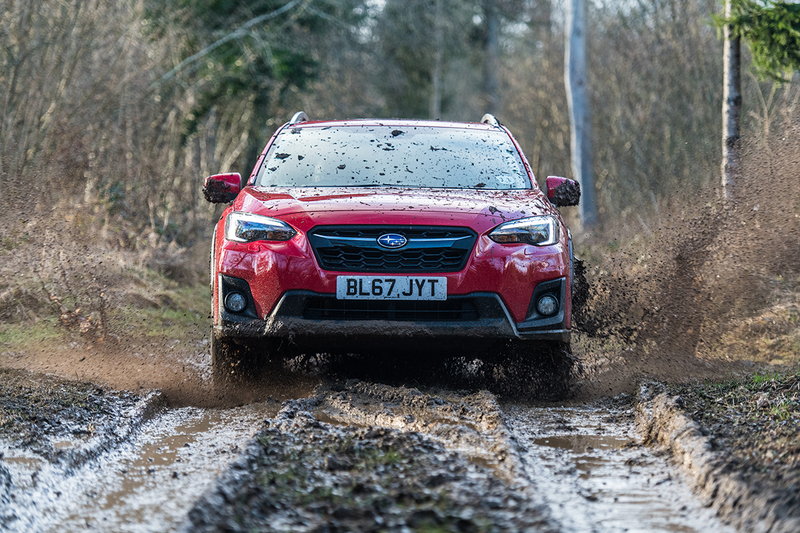 The result is a car that feels safe, predictable and, needless to say for Subaru, supremely grippy both on-road and off. I just can’t help wishing that they hadn’t fitted a Constantly Variable Transmission (CVT). If you need to make any kind of progress it serves only to make the engine sound strained whilst simultaneously making you feel as if the clutch is constantly slipping. I know the Japanese and the Americans (both core Subaru buyers) love such things, but CVTs just aren’t for me. I’d wager it affects performance and economy too: 40.9 mpg combined and 0-62mph in 10.4 seconds are hardly class-leading. Neither is the XV’s price tag. £28,495 seems expensive for something that ultimately struggles to offer either the refinement or the economy of its rivals. But maybe, just maybe, I’m missing the point. Flawed though XV maybe, there’s no doubting it’s far more capable, rugged and perhaps reliable than many of its contemporaries. You could take an XV to places many a more suburban SUV would fear to tread. And there lies its appeal. Your decision to buy the XV ultimately boils down to whether you actually need a genuine work-horse, or you’re just hankering for yet another show-pony. Transmission: 7 step Lineartronic CVT. All-wheel drive.